Do you sometimes find it difficult contacting Sheffield City Council? Find the experience stressful and frustrating? 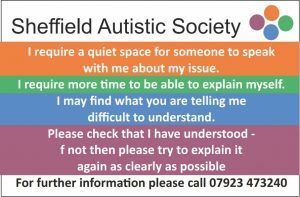 We have been talking to people at Sheffield City Council to try and make things easier for people on the autism spectrum and have put together this guide. You don’t always have to make a visit to the Council offices. You can contact the Council by email at customerservices@sheffield.gov.uk with any query or problem you have. They will reply to your email within 3 working days. You can also request a face-to-face meeting by email if you find it easier to speak with someone in person. Just let them know that you need an appointment and the specific enquiry you have so they can arrange for you to be seen by an experienced member of staff. They will meet you in Reception so you don’t have to queue up. You can call the Council on 0114 2734567 and speak with an Advisor. There is a recorded message which will tell direct you to the department you need and an automated selection system to help you get to the right person. If you struggle with the automated selection service then please keep holding on the line until the end of the message. You will then be put through to a Switchboard Operator who will transfer you to the right person to help you. The Council has a main First Point within Howden House where you can access services and use our Self-Serve computers. There are local First Points at Chapeltown, Crystal Peaks, Hillsborough, Stocksbridge, Manor Top and Burngreave. Please note they are very busy on Mondays and over the lunch time period – 11am to 3pm. If you can try and visit outside these times and it will be less busy and noisy. You can obtain an A Card from the Sheffield Autistic Society. See Contact Page or call in to our Drop-In on Mondays 11am until 2pm at The Circle, Rockingham Lane, Division Street, Sheffield.